Ritmo represents the third instalment of Avo’s Syncro series. The catchy name means “rhythm” in Spanish and is a reference to Avo Uvezian’s musical background. While the 30th Anniversary is the same blend as the original Ritmo, it is distributed in a unique and eye-catching limited-edition box. Only 1,000 were released during the course of 2018. Featuring tobacco from a whopping seven different countries, its varied composition is a testament to multinational blending. Therefore, unlike the Nicaragua, the part of the Ritmo’s namesake is a continent rather than a country. Featuring a mottled light brown wrapper, the Ritmo’s hue is reminiscent of a artisanal milk chocolate or a café latte. The mottled texture is oily and inviting beneath the duck-egg blue and pastel orange wrapper. Meanwhile, the rolling consistency is overall even with a few slightly hollow areas and a soft, supple spring. I confess that I found this to be somewhat disconcerting at first. Interestingly, the box-pressed finish was quite unusual with visible creases in the corner and across the wrapper as if it was loosely draped over the binder. As for the aromas, the foot has a touch of barnyard hay and a hint of saddle leather. However, it’s dominated by an overt hazelnut and chocolate accord that’s somewhat reminiscent of Nutella. 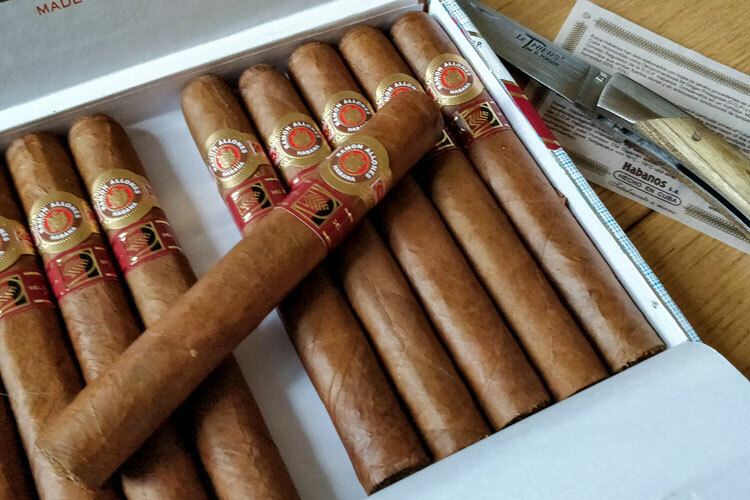 Typically, we smoke about four cigars for a review in order to get a broad picture of the experience it provides. Between Paul Anthony and I, we actually smoked about half a box towards reviewing the Ritmo, which is much more than our usual amount. In short, we quite enjoyed them! Following a quick snip of the cigar comes the dry draw to explore the flavours to come. I found the Ritmo to be very subtle compared to the aromas on the foot. In fact, I admit that I struggled to pick up much beyond an initial whiff of cedar. However, persisting revealed a touch of the barnyard hay experienced earlier as well as a slightly salty and metallic hint of copper. After lighting, Avo’s Ritmo begins with thick clouds of smoke and rich flavour. Rather than power through, I usually set it down after a few draws for the burn to stabilise. After a few minutes of cradling, the instead cigar develops a complex and nuanced character. Ritmo initially opens with an astringent yet luscious hazelnut and cedar accord. Meanwhile, a tingling and bittersweet grapefruit sensation can be detected on the retrohale. The second third begins with an interesting transitional note of leather that is reminiscent of so-called “new car smell”. I was quite surprised with this but it wasn’t at all unpleasant! As the second third’s bouquet develops, it reveals notes of frothy cappuccino complete with the cocoa powder. Similarly, the nutty aromas persist with a slightly caramelised Pecan flavour in the retrohale. As the subtly nuanced flavours draw towards the final third, the cigar begins to reveal more charred aromas. Notes of charred oak cast over hints of pepper while a toasted rye bread finish lures you closer to the nub. These are amplified as you continue to smoke past the band and occasional hints of charred flavours can be picked up throughout. Before going further, I’d like to briefly touch on the Ritmo’s fragile wrapper and how care should be taken when handling the cigar. Being exceedingly delicate, I discovered that the slightest mishandling damaged the wrapper. From clumsily removing the band to even lighting the cigar, the wrapper easily peels away or gets scratched. For instance, even a jet lighter at a safe distance would scorch the wrapper across one side. By the time I came to writing this review, I avoided exposing the Avo Ritmo to a jet lighter at all and used a conventional flame instead. While this isn’t necessarily a negative point, it’s something to be aware of when smoking a Ritmo for the first time! Furthermore, the bands tend to be heavily glued in place with some traces finding their way onto the wrapper. When removing it, I made sure to leave this until the last minute so to warm the glue and not damage the band. However, this wasn’t always successful. As mentioned earlier, the Ritmo has a somewhat loose and uneven construction. This is sadly reflected in the burn, which is occasionally inconsistent. However, it tends to correct itself by the second third even when Paul and I smoked some in strong winds. With regards to the draw, it tightened slightly after lighting. While it was still somewhat loose, it provided just enough resistance for a pleasant smoke. Between this and the box-pressed shape, I found that the Ritmo smokes very coolly, which greatly benefits the overall smoking experience. Finally, the total smoking time fell a little short of expectations. Overall, our cigars lasted around 70 minutes but could be stretched to 80 with some careful smoking. As a carefully balanced cigar, the character sits somewhere between a mild and medium body. With the initially bittersweet grapefruit retrohale and nutty notes, I found that it was a cigar that paired rather well with dark mature rum. A particular favourite of mine was the Diplomatico Réserva. Otherwise, I tend to enjoy this cigar best with either tea or coffee. A mild Italian Manaresi Miscela Oro espresso would be my preferred choice. However, I tend to opt for the longer experience brought by an Earl Grey tea instead. That said, lovers of marrying whisky and cigars could certainly pair this with their favourite Lowlands Scotch. For instance, a crisp and floral Glenkinchie would make an ideal accompaniment. I’m quite fond of the limited addition box supplied with Avo’s 30th Anniversary Ritmo cigars. Made with a similar construction to Camacho Cigars, it consists of a lacquered case with a thin paper cover inside. The design is somewhat contemporary with a traditional streak, featuring splashes of the Ritmo’s duck-egg blue and pastel orange across the lid. I’d also like to add that I do appreciate the colours and find them to be quite appetising, which reflects the cigar’s experience quite well. Meanwhile, the three bands are quite attractive with an interesting design that has a retro vintage feel. The 30th Anniversary band on the foot is the hardest to remove due to the cold glue while the second “Ritmo” band is the easiest when warm. The main band is quite challenging to take off and requires some patience. With a little careful manipulation, the matte paper will likely tear but comes off without damaging the wrapper. Finally, the Ritmo’s price is a little on the high side but I believe that it offers good value for money. 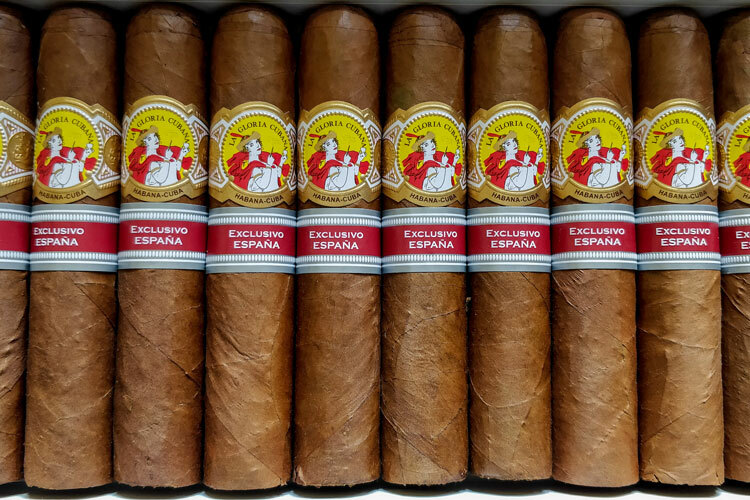 At a $238 MSRP for the limited edition box of 20 cigars, it comes to about $12 a stick. While this indeed a relatively premium price above the $10, the Ritmo offers a complex bouquet of nuanced flavours that stimulates even the most stubborn palate. When Should You Smoke A Ritmo? Being an ornate cigar with an attractive box and band, the Avo Syncro Ritmo presents itself very well as a cigar for formal events. Furthermore, I find that the intricate flavours render it as a social cigar. Personally, I would enjoy the Ritmo most when tasting it in a group as it prompts discussion and debate over the flavours and experience. However, I have sampled a few while taking the dogs for a long stroll, which is just as pleasant. Nevertheless, I would suggest that the Ritmo is something to reserve for occasions as I believe that it would also age quite well. Although the construction is a little on the loose and uneven side, the blend itself is a marvel of multi-cultural cigar making. Throughout the smoking experience, the aromas evolves nicely and form delicate accords that can be easily appreciated. Offering a rich yet subtle variety of flavours, the Ritmo is a wonderfully deep cigar that can be enjoyed by both enthusiasts and novices alike. In fact, I would recommend this as a great cigar for beginners to enjoy with friends who are more experienced smokers. Reviewed by Charles-Philippe, on 8th January . "A nuanced & complex cigar. With a developing bouquet of rich and subtle flavours, it's easy to look past the Ritmo's occasionally inconsistent construction." Have you checked out Avo’s Nicaragua? We’ll be publishing a review very soon!